Close your eyes and picture the Colombian Pacific. What do you see? Lush rainforests? Capuchin monkeys and tigrillos? Humpback whales? 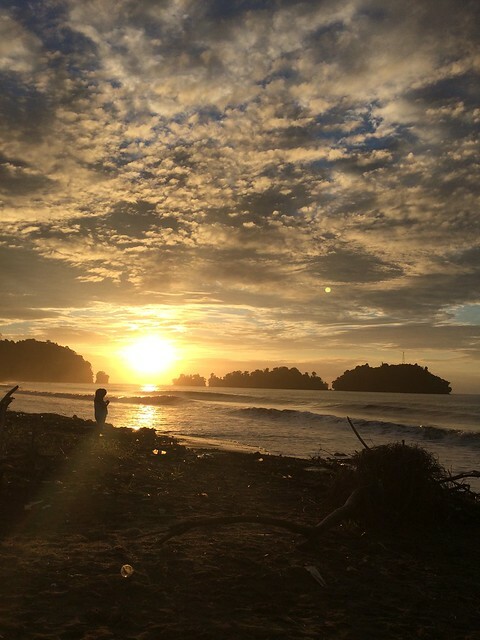 Did you know Colombia’s Pacific coastline, which extends about 900 miles between the borders of Ecuador and Panama, is just longer than California’s? Or that it is one of the rainiest places on earth? I didn’t. I also didn’t know that about 10% percent of the land in Colombia is protected, or that Colombia, and this area in particular, is one of the most biodiverse places on earth. Furthermore, I didn’t know that while about 10% percent of Colombians identify as Afro-Colombian, around 90% percent of residents in the departments of the pacific region identify as such. Finally, I didn’t know that a large part of Colombia’s long and gruelling drug war disportionately affected this area, where dense rainforests easily hide and facilitate the movement of illegal substances. I was starting to learn all this from my trusty guidebook as we landed at Nuquí’s small airstrip. There are no nonstop flights from Bogotá; all planes that arrive in Nuquí are run through the government-backed airline, Satena, which provides necessary, but at times infrequent and unreliable, service from Medellín and Quibdó. As we flew over the stretch of land separating Quibdó and Nuquí, I was struck by the sheer geographic isolation of the region. Our flights from Bogotá to Quibdó and Quibdó to Nuquí provided us access to a dramatic landscape of impressive mountains that slowly give away to dense, verdant rainforests and snakey brown rivers until the immense Pacific Ocean appears. We stepped off the plane into intense tropical heat. It was sunny, hot, humid, and we could hear fast paced salsa from somewhere down the road. The small airport functions and feels more like a bus station: people come in and out asking about arrivals and departures; drink a beer or share a meal under palm trees outside; and meet up with friends and family. Because of the lack of roads, there are no cars in Nuquí, but plenty of motorbikes. The airport is in the middle of town, steps from the main port. We crossed over to the small port, whose rocky, corroded sides seemed to want to slip into the river at any time. From here we set off for Parque Utria. We piled into the motorboat headed for the ocean. Before employing the motor where the river met the ocean, the drivers used thick, wooden poles to push us along. 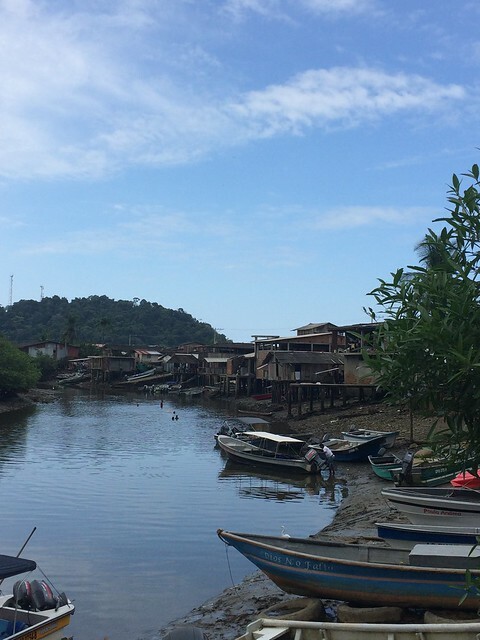 Wooden homes on stilts dotted the Nuquí side of the landscape: people watched us from their doorways and balconies, young kids, some equipped with machetes, swam in the water, and soldiers at a small military outpost stopped us briefly. Our drivers quickly advised us to take no photos. This was our first introduction to Nuquí. After enjoying two long, sunny days in Parque Utria, we returned to Nuquí in a downpour to a more crowded river. We floated by large, tiered boats along the narrow river. From our small motorboat, we could see that they were filled with fruit and other items. 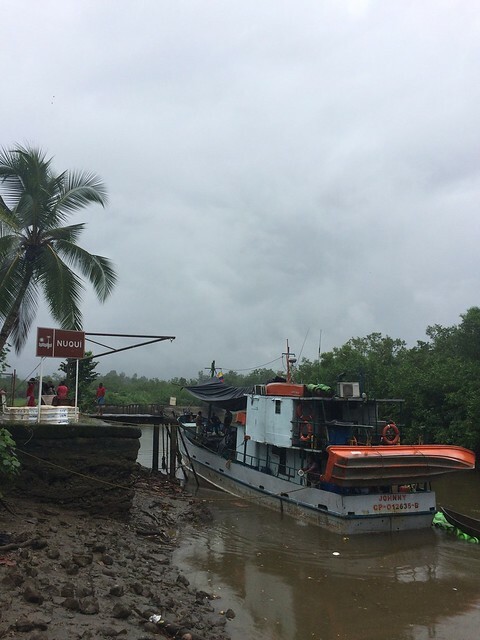 Given the lack of roads to Nuquí, these boats likely carried the subsistence and wares needed by this town of 2,000 residents. We disembarked at the same tiny port just as the rain began to wind down. Three of us, with bags, packed into a tuk-tuk and headed for the cabins we’d be staying in, recommended by Mano Cambiada, along the long beach of this small town. We bumped along dirt roads, through puddles — some of which had clever wooden boards over them perfectly sized for a front motorcycle wheel — and over rocks. We saw the enormous expanse of the ocean road. Our hosts, an older mother and daughter and a couple of grandkids, provided excellent hospitality. We visited Escuela de la Migracion, an initiative supported by Mano Cambiada and established at their community center, promoting the pacific region’s rich arts and culture through music, sound production, and dance. We watched an informal traditional dance performance and heard songs from a local band reminiscent of New Orleans big brass bands. We felt transported to a different place entirely. Here we were, in an unfinished community center in a small town on the edge of Colombia listening to incredibly talented young men playing in some sort of innate unison. The majority of the band members, despite all being younger than 22 years old, had been playing together for eight years. Although some of the members have left, or were planning to leave, to study in Medellín — there are no educational opportunities for study in Nuquí beyond high school — they all echoed the sentiments we’d heard across the pacific region: a fierce connection to space, collective identity, and territory and an emphasis on the importance of preserving them. On our way back to the cabins, we decided to walk along the long expanse of beach. The town had been quite this Sunday afternoon, but we soon realized why. Half the town, it seemed, was gathered at a bar spot on the beach playing volleyball, jumping on a trampoline, swinging, eating, dancing, and swimming. The music was bumping; the joy was endless. We waved to a couple of the members of the band who were now busy passing a soccer ball around. As we made our way past the crowd to the beach, we realized that the gorgeous verdant scenery gave way to an beach full of trash, including jagged glass, styrofoam, and plastic bottles of varying sizes. Because Nuquí sits on an inlet, garbage from around the pacific region circles into here, gets stuck, and washes onto the beach. It spoke to the need for a thoughtful development plan that respects them and the natural environment. As the sun set over the water, we reflected on the fact that the residents of this beautiful corner of the world were the ones to deal with this regional issue. The connection to territory that the residents spoke at length about is intrinsically linked to their respect for the territory. Despite poor investment and infrastructure, the vitality of the culture and the connection to place is what makes this region stand out. It is resilient, bold, beautiful.